Read our timber care page for information on the natural features of our garden products. Timber is a natural material and each piece will have its own unique characteristics that tell a story. Products made from timber are an environmentally friendly alternative to metal and plastic. All Zest 4 Leisure products are grown to high standards given by the Forestry Stewardship Council (FSC). To find out more about how we care for the planet, visit our environmental page. 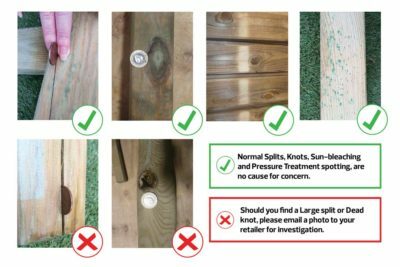 Although the majority our products come with a 10-year guarantee against rot, we recommend that you follow timber care measures to ensure your product lasts for many years to come. Changes in temperature and humidity can cause timber to expand and contract. This can result in splits and cracks naturally appearing on the wood. It will not affect the strength or durability of the product. 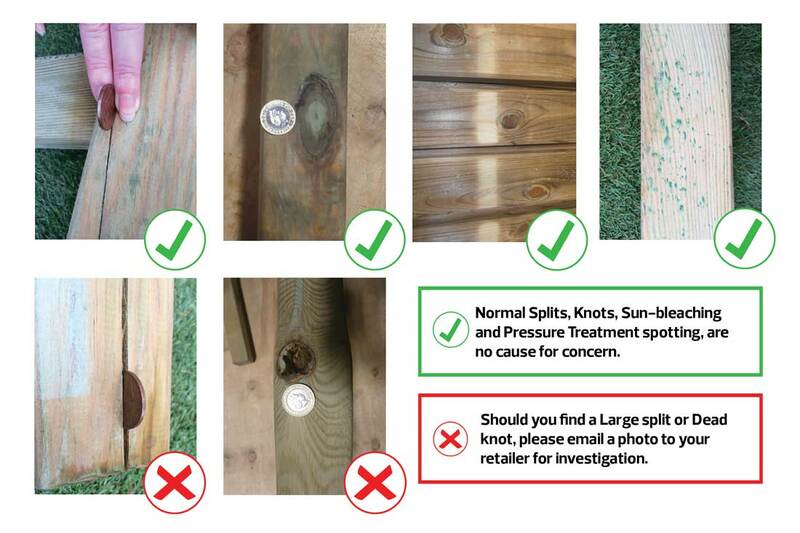 However, if you have any concerns, if a 2p piece fits easily into the split or crack, email a photo to the retailer you bought the product from. They will then investigate and arrange an exchange, if necessary. Green spots are a natural occurrence due to the pressure treatment process. During the process, salt leaves the timber and appears on the wood as green spots. It will fade over time and does not affect the durability of the product. Ideally, we advise you to wait 6 months before applying any further treatments or painting the wood. During this time, the pressure treated wood will dry from within its core. If you wish to treat or paint your product, at a later stage, any paint or treatment specifically for timber is preferred.